As it has been a month since my card was published in CARDS July issue and the August issue is now out, I'm allowed to show my card online. I still don't have a copy of the magazine, but can see an online version of it. This card was submitted to the wedding category for the submission call. I love the photo they have taken for the magazine page! 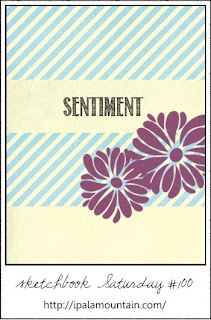 At the time, I had just received my PTI 'Lovely Layers' stampset and dies and I combined it with my favourite papers from Pink Paislee. Sadly, I don't have much of the papers left as I made quite a few cards out of the 6x6 pack! 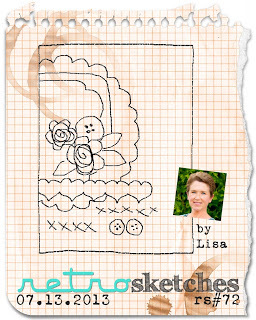 I also have another card in the current August issue of CARDS in the Sketch category, I will share details next month. 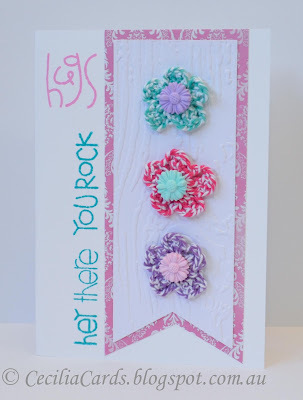 Did anyone notice that I got another mention on the Paper Smooches Sparks blog for this card submitted for the Picture Perfect challenge? I'm having so much fun with my new PS stamps! Thanks for dropping by! I got out my Hero Arts Asian Dolls stamps for a play today. I used the sketch from Cardabilities and the Basic Grey True Love collection (perfect for an Asian wedding card). Here is my lovely couple dressed in BG True Love! I mixed up stamps from 3 different companies, just for a bit of a change and also because they fell in quite nicely together. I'm also submitting this to Simon Says Stamp's Celebrate challenge. By the way, has anyone seen the August issue of Cards magazine? 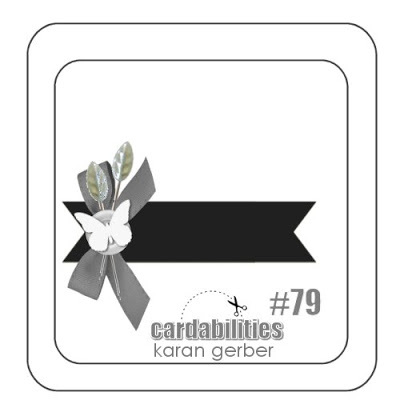 You can find my sketch card on page 68. Now that the August issue is out, I guess I can show my card from the July issue. I'll do that tomorrow. Neenah Natural White, Basic Grey True Love 12x12, Hero Arts Asian Dolls, Simon Says Stamp Mom's the Best, PTI Year of the Flowers - Roses, Ranger Archival Jet Black, Hemp from Hemptique, MME Enamel dots, pink marker. Quite a few of my friends know that I like a good sunrise or sunset photo. 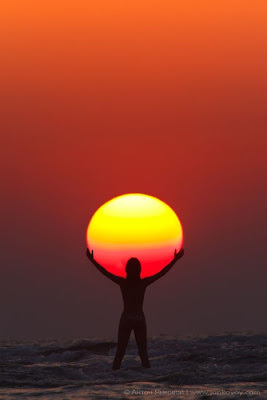 Whenever I see a great sunset or sunrise, I have to take a shot. 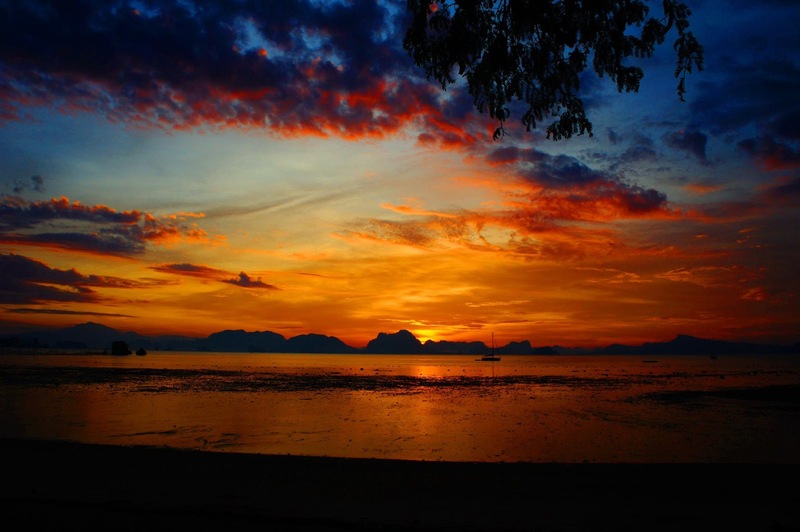 When we were in Phuket last year, I woke up before 6am on several mornings just so that I can get a great shot! 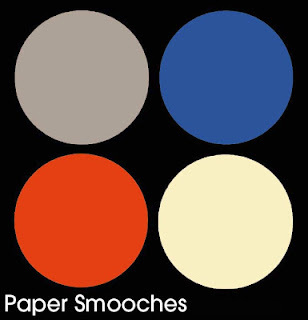 So when the Paper Smooches Sparks Challenge photo was posted this week, I could not resist. The card was already done, in my head. Here is my card and also my photo of sunrise over Phang Nga bay in Phuket. I'm also submitting this card to Moxie Fab World Birthday Card challenge and Simon Says Stamp 'Celebrate' challenge. Thanks for dropping by! A last minute card for the PTI Fruits of Summer Blog Hop. 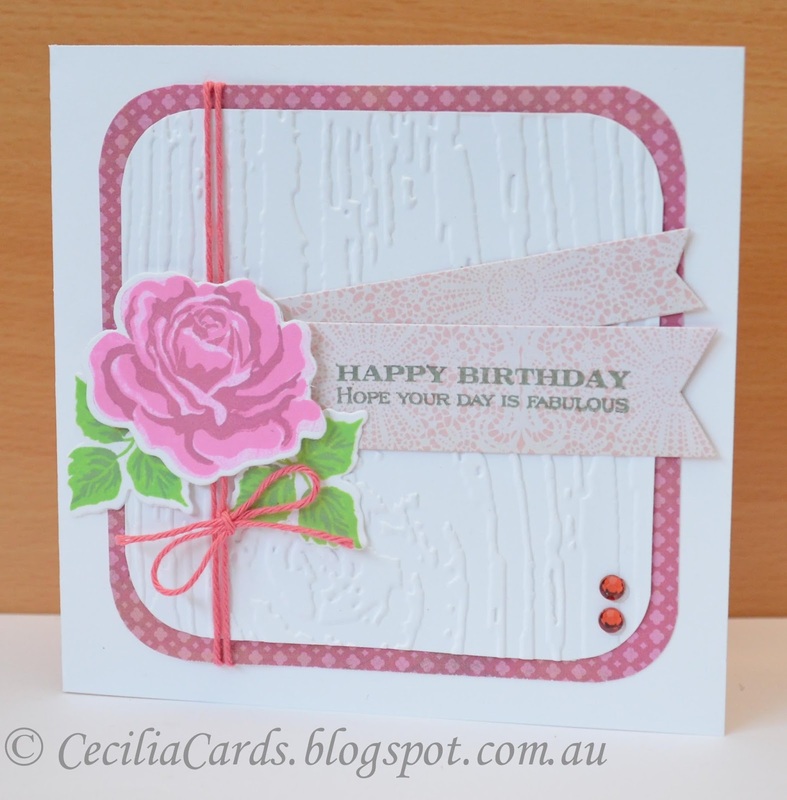 I had stamped a few roses a few nights ago and had not finished my second card for the Blog Hop. My first card has already been posted here. Thank you for all the lovely comments so far! 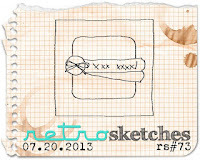 This card is made using this week's Retro Sketch. I'm also submitting this to Moxie Fab World Birthday Card Challenge. 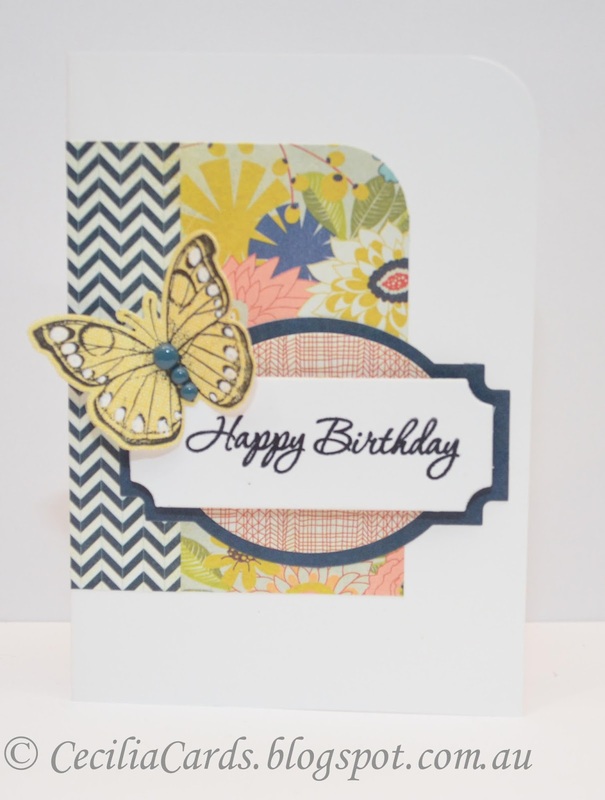 Check out the PTI Blog Hop, there are some really beautiful cards there! I had a fun day at the Craft and Quilt Fair yesterday and attended a 2 hour workshop in Freeform Fibre Art with Prudence Mapstone. I will blog more details another time. Neenah Solar White card, My Minds Eyes Indie Chic Saffron and Sweetest Thing Honey, Sizzix Tim Holtz EF, PTI A Sweet Life and Boutique Borders, Hero Arts Bubble Gum, Green Hills and Field Greens, PTI Plum Pudding, Strawberry Twine from The Twinery, Kaisercraft Gems, MFT DieNamics Fishtail Layers STAX and PTI dies. 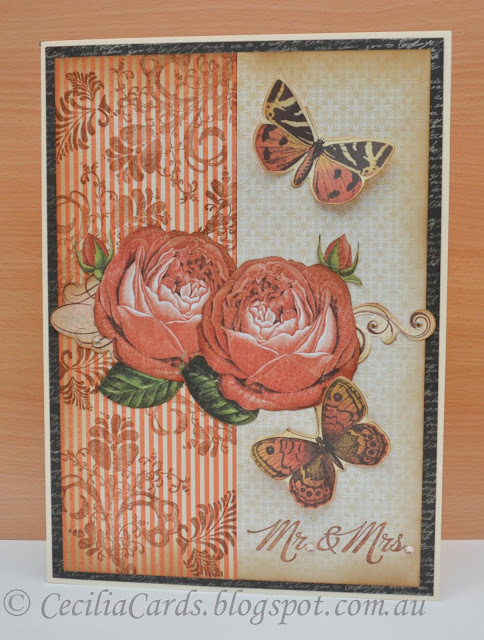 Here is my second wedding card that I made for my work colleague! 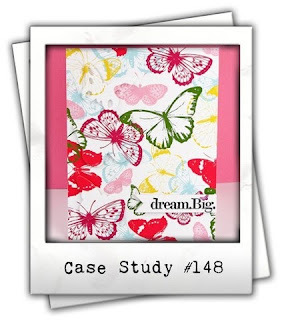 It is an A4 size card which I often have problems with - this is why I don't scrapbook! 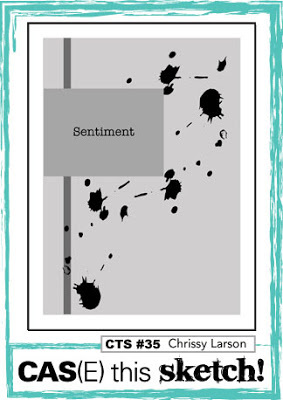 I wanted to avoid banners as I usually resort to when I have no mojo! When I saw Chupa's sketch on the weekend, I wanted to see if it would work in an A4 format. 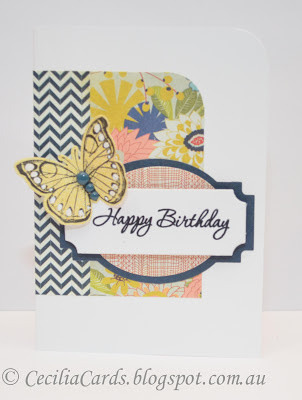 I've used Kaisercraft's new Curiosity collection which is being revealed in CHA in Las Vegas this week. It is not yet available in the shops. I've made a few cards already with this collection and I just love the colours! 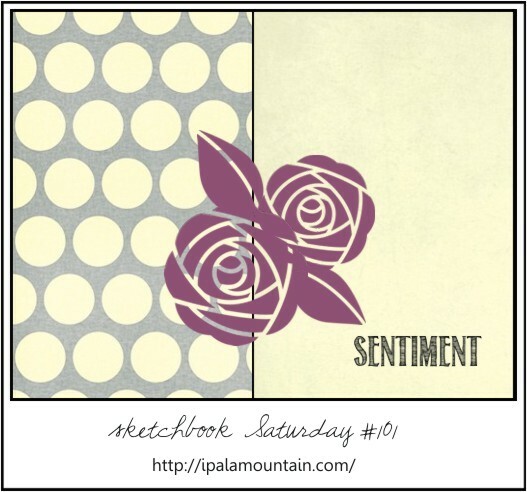 Here is my card and the Saturday sketch below it. 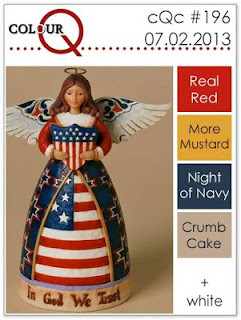 I had a query about the vellum I used in this post. I bought this a while ago and I'm not sure if Daiso still stocks them as some of their craft items seem to change whenever I go there. It is not available online. I believe they do have some stores in the US. 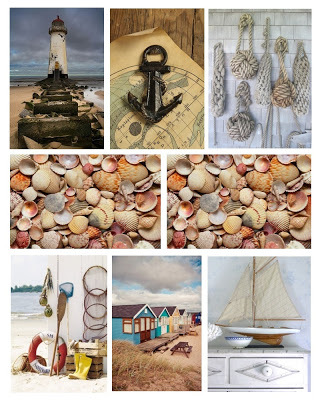 It's great to shop there for various crafty items. I get my containers, misters, tweezers, washi tapes, origami papers,etc... Although the items are only $2.80 each, when I check out at the counter.... $$$... ka-ching!!! I'm looking forward to the Craft and Quilt Fair tomorrow. 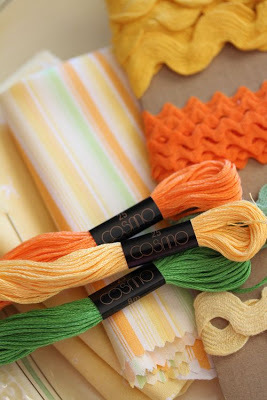 I'm taking a well deserved day off to attend and I've also booked myself in for a class with Prudence Mapstone, so really looking forward to doing a bit of knitting and crochet with her. 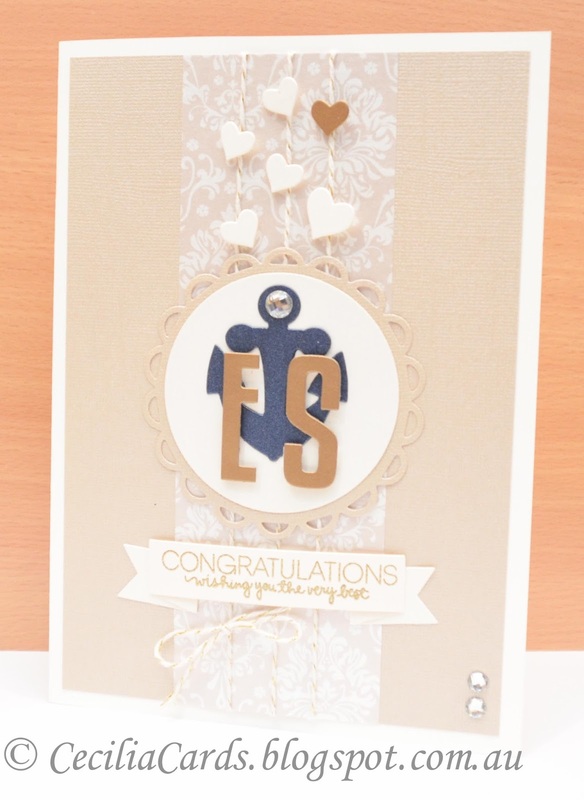 My friend at work is getting married to a Naval Officer and I ordered an anchor die from Paper Smooches which finally arrived last night. I had a rough idea of what I wanted to make and was not sure how to put it all together. When I saw this week's Online Card Class Summer Camp sketch, I wanted to try it. 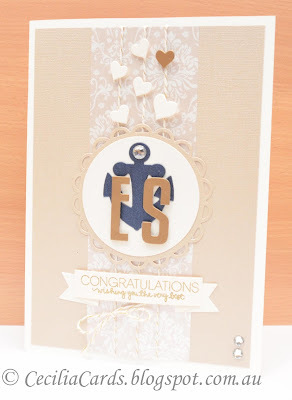 We are supposed to use a certain colour scheme, but it is not going to work with this card as I wanted Navy and cream as the main colours. Here is my card. The inside of it is stamped with the PS Hubby and Wifey stamp set. I'm submitting this card to Simon Says Stamp -By the Sea challenge. Oh, by the way, did anyone spot my cards on the Paper Smooches Sparks Challenge (Cool Shades) and the Picture Perfect challenges? It got a mention as one of the runners-up! Yay! Thank you for dropping by! 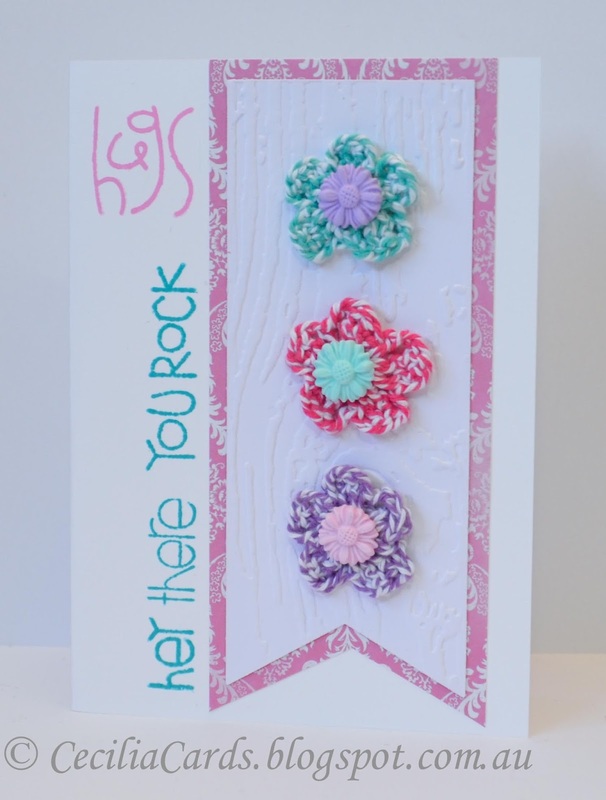 I'm also adding this card to the Paper Smooches Sparks Challenge - Anything Goes. Curious Metallic and Bazzill Metallic cardstock, Simon Says Stamp Banner Sayings, Paper Smooches Hubby and Wifey, Versamark, Delicata Golden Glitz, Gold EP, SSS Banner and Hearts dies, Spellbinders Nestabilities lacey and standard circles, PS Anchor die, Twine from The Twinery, Studio Calico gems. I have had this packet of vellum polka dot papers for a long time now. I got this Origami pack from Daiso - a $2.80 Japanese store. 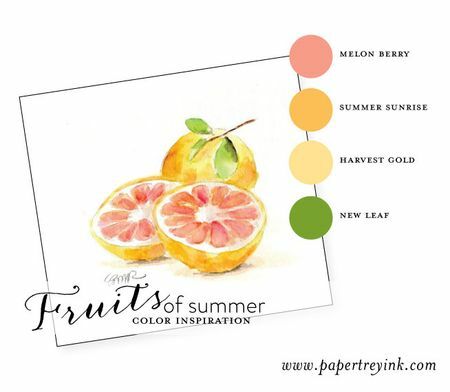 I made them for the following challenges using a PTI die and the colours from PTI Fruits of Summer Blog Hop. 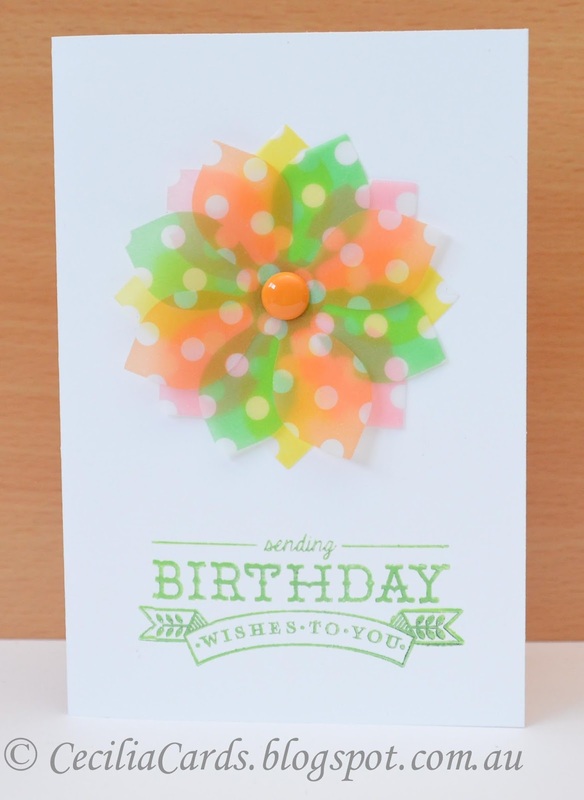 This is another card I made for the Moxie Fab World Birthday Sketch. 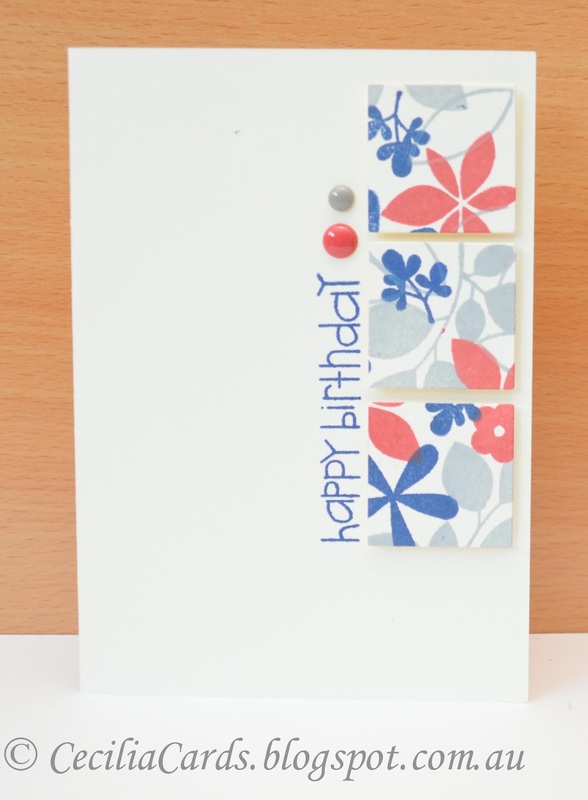 Although I don't have a 'Birthday' sentiment on the card, it can be used as a birthday card. The crochet flowers were made by me along with the clay flowers in the centre. I recently got some moulds from Natalie from HappyDaks and had fun making flowers from FIMO clay. Since all the flowers were handmade, I'm submitting this card for The Less is More - Make Your Own Flowers challenge. Neenah Solar White card, Kaisercraft Tigerlilly, Tim Holtz Embossing Folder, MFT DieNamics Fishtail Layers STAX, PS Sentiment Sampler, HA Bubble Gum, Tim Holtz Peacock Feathers, Twine from The Twinery, FIMO, Flower moulds. I managed to make up for time loss during this week last night. This CAS card is a combination of two challenges for Paper Smooches July Cool Shades and the sketch is from Moxie Fab World Birthday Sketch challenge. I recently purchased this PS stamp set and it has been on my wishlist for a long time now. I just love it! Here is my card, thanks for dropping by! I was very productive the last two nights and managed to make a few cards. One is for friends who just had their first child this week. 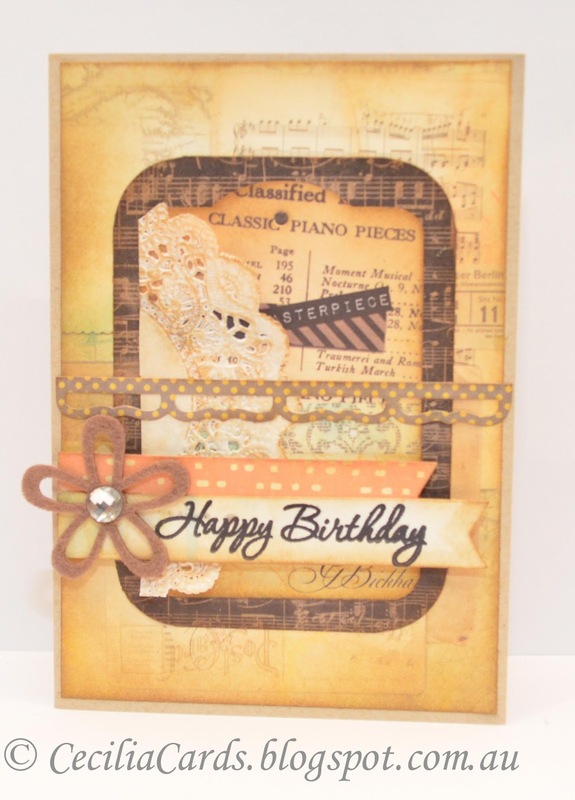 I used the current Retro Sketch for the card and the lovely papers from Fancy Pants. Here is my card and thanks for dropping by! I've made this card with the current Fusion #13 sketch challenge. This card started off with the intention of being a birthday card for a female. 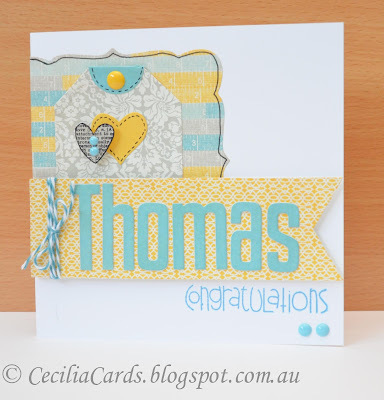 When I decided to use the Kaisercraft Vintage Timeless and Recollectables, it took off in its own direction and became a Father's Day card (Our Father's Day in Australia is in September) instead! It had a mind of its own!! 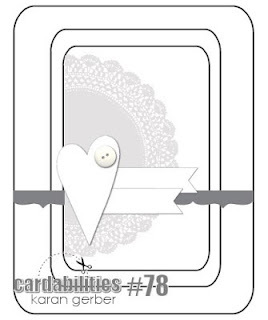 I used elements in the Recollectables diecuts to create the framework of the sketch. 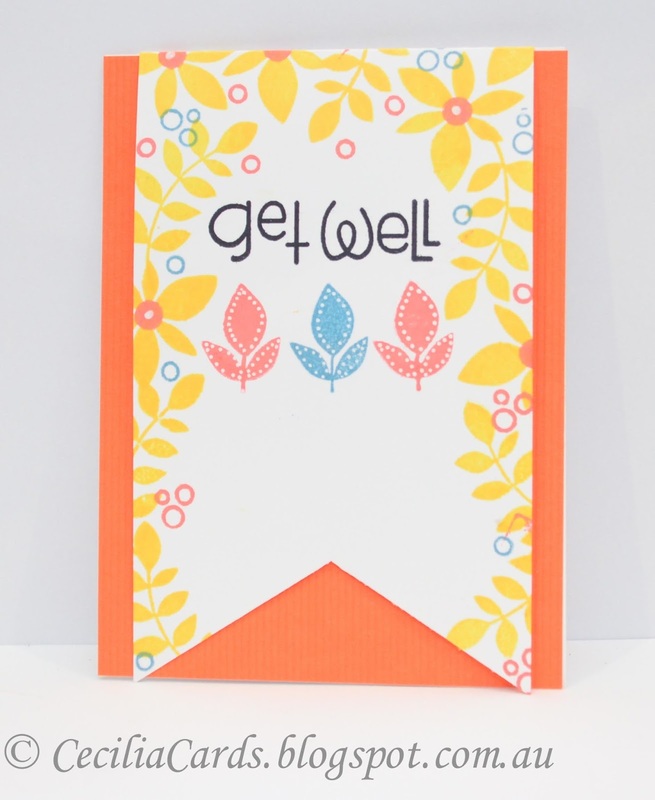 It was a very easy card to make and although I did not time it, it probably took about 10 to 15 minutes to make. I've also used the colours from the current Play Date Cafe challenge. Here is my card, thanks for dropping by! A big HELLO to my new followers on my Facebook fanpage! 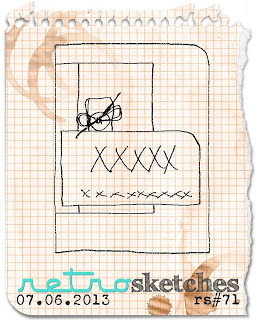 This is my second sketch for Week One of the Online Card Class Summer Camp. The background, if you look carefully is embossed vellum but not too closely just in case you see the 'invisible' double sided tape I used!! I will try and do the third sketch before the weekend! 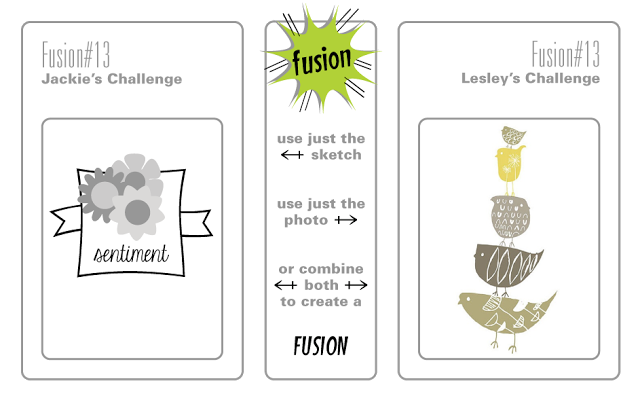 The next challenge is to make a 10 minute card! 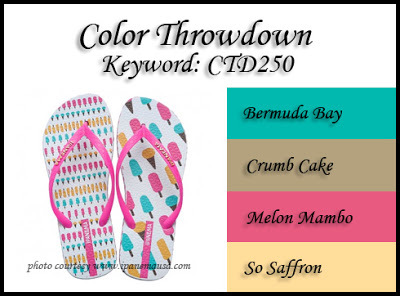 The colours of the card is based on the colour palette for Week One which is very similar to this week's Color Throwdown colours!. Thanks for dropping by! 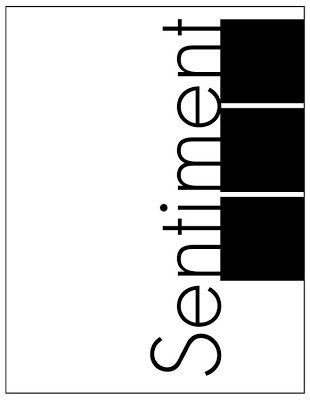 I love the Cardabilities Sketch this week and wanted to make a card with Basic Grey Serenade. 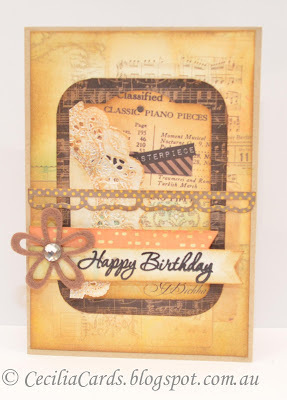 I decided to add a tag to the card so that I can submit this to the Moxie Fab World Birthday Tags and Wraps challenge. 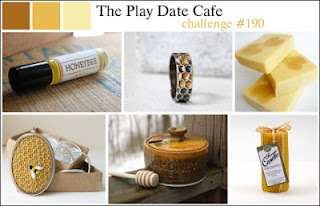 I've also used the colours from Play Date Cafe and The Simon Says Stamp and Show A Little Stamping challenge this week. I also added a felt flower that I got in my Hero Arts warehouse clearance sale. Thanks for dropping by! I'm on a roll with these 21st guest albums! I made one for my niece last year for her 21st, not with the intention of making more for private orders. Lo and behold, this is the third order in the last 6 weeks! 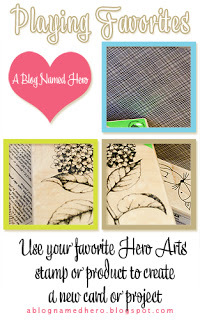 Nevertheless, I've enjoyed making them, but I've now used up all my Tim Holtz Ideology keys! This order is from Western Australia and the specifications were black/white and red 1920's vintage. So I'm thinking tassells, feathers, pearls, Great Gatsby, silver and gems. After a couple of consultation with paper design selections, I decided on the Kaisercraft Timeless Vintage Black and White for the inside pages and After Five for the cover. 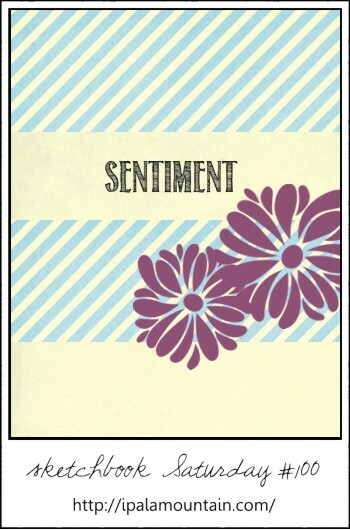 The accents are from the Porcelain Rose collection (I love the flowers and birds in this collection). I had a bit of problem with two different sized papers 6x6 and 6.5x6.5 which I solved with matting with the 6.5x6.5 on the front. The inside pages are all 6.5x6.5. There is room inside the covers for photos to be added (I added extra papers for mats and embellishments to adhere over the photos). Hope Chelsey likes it, her party is at the end of this month! I've ordered more vintage keys and they've just arrived... so I'm ready for the next order! 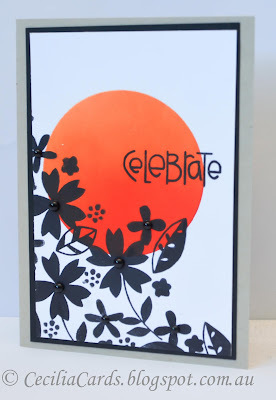 I'm submitting this project into Simon Says Stamp and Show A Little Stamping and Die Cut Diva's July Summer Flowers challenge. 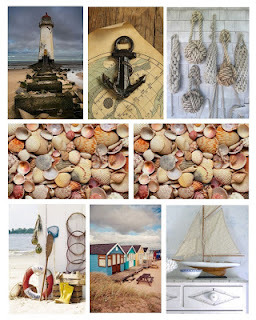 Just a reminder that I have just started a FB fanpage, please click link on sidebar and 'Like'. 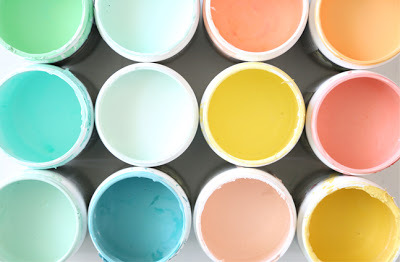 I'll be sharing my works in progress, finished projects, links to giveaways and tutorials there. Thanks for dropping by! A bird eyes view of the album, 8 pages on one side and 6 on the other. The inside covers are for photos to be added later. The rest of the pages are for guests to sign and write messages. Others - Kaisercraft Porcelain Rose Collectables, fringe from Spotlight, Kaisercraftcolour Scarlet, Hero Arts Silver Embossing Powder, Viva Decor silver paint, Kaisercraft ribbon, flowers, pearls, pearl brads and rhinestones, Tim Holtz Ideology Key, Twine from The Twinery, Ranger Stickles and feathers. 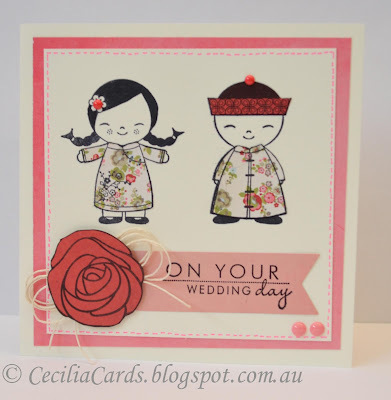 It feels funny that we are in the middle of winter in Melbourne and I'm attending a Summer Camp for Cardmakers! It's OK, I know at least two other Melbournians who at going to the same Camp! Here is my homework from the Day One lesson. I used all the colours and the first sketch. Looking forward to seeing what else is in store for the next three weeks! I'm going to try and keep up with the homework! Others - White gel pen... oops in a hurry to upload and forgot to add enamel dots!! 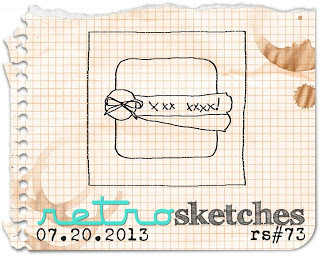 I love the Retro Sketch this week and couldn't wait to make a card with it! I wanted to step a little bit out of my comfort zone and picked some bold patterns, inspired by Moxie Fab World Mixy Matchy Style challenge. 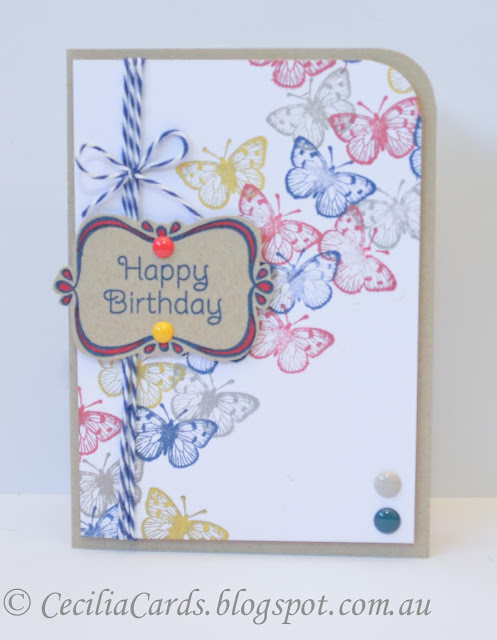 I picked two old favourites, BG pb and j/Picadilly and the HA Antique Butterflies for the A Blog Named Hero Fave Stamp challenge. One of my first purchase when I started stamping was the Hero Arts Antique Flowers and Butterflies framelits stamp set. It is my most hardworking stamp set! 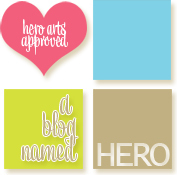 When A Blog Named Hero announced the My Fave Stamp challenge, this was the set I reached out for straight away. Unfortunately, over time, I have misplaced the medium butterfly, so I only use the small and large ones. 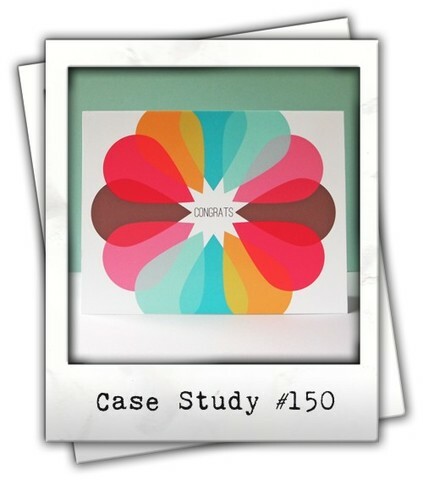 The CAS(e) this sketch and CASE study (with Joscelyn Olson) challenges were perfect for the card I made. 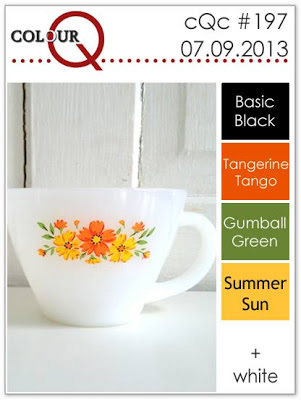 I also used the colours from the ColourQ challenge this week. 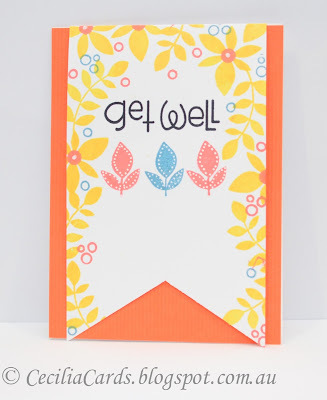 Here is my card which was fun and easy to make! While I've got the stamp set out (it really doesn't get packed away for too long), I made this quick Thank You tag. Thanks for dropping by! This is my first ever entry for Chupa's Saturday Sketch and it happens to be her 100th sketch! As I have been following her on FB, she announced that she will be posting her sketch on Saturday night, so I decided to play along. I wanted to use the colours from Moxie Fab World Tuesday Trigger Scene in Tangerine, this will be my second card, the first one was blogged here. 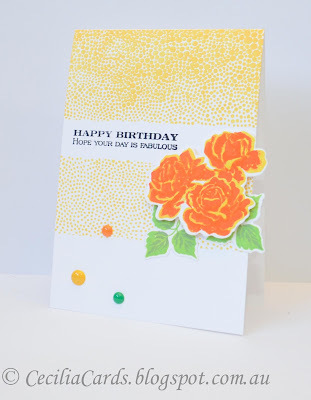 I decided to mask the card before stamping and used my PTI roses. 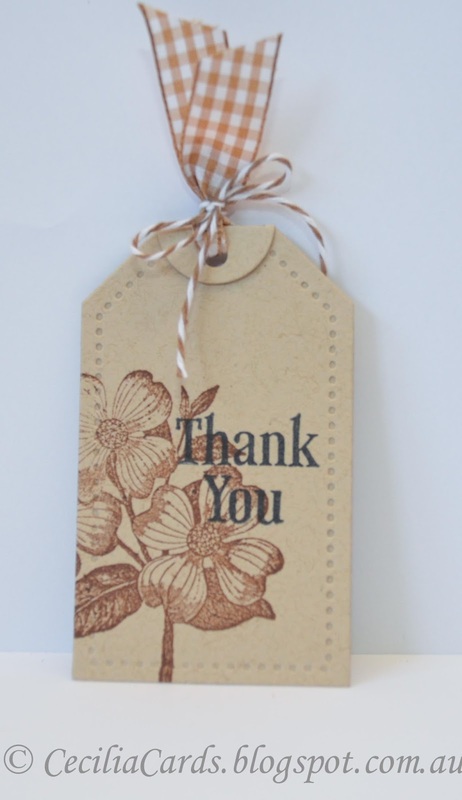 Here is my card and thank you for dropping by! 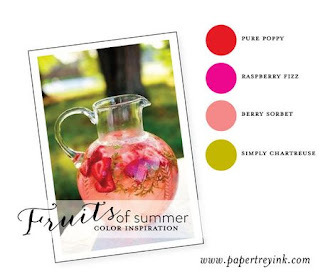 PS - I'm also adding this card to ColourQ challenge#197!